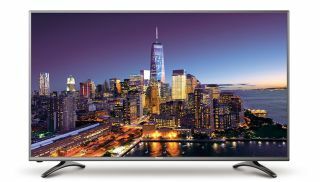 Hisense brings affordable 4K HDR TVs to the US market | What Hi-Fi? There are 22 new models in the Hisense TV range for 2016, including affordable 4K HDR-enabled sets and flagship curved ULED Quantum Dot TVs. There will even be an 8K model later this year. Hisense may not be a household name in the UK, but it's the No.1 TV brand in China and the third largest TV manufacturer in the world. So, to grow its dominance, it has unveiled no fewer than 22 new sets at CES, with its most affordable 4K model, the 43in 43H7C, selling for just $400 in the US. All Hisense 4K TVs will feature HDR (High Dynamic Range) processing, which is based on the UHD Alliance HDR specification. Further up the range the H9 and H10 Series employ the latest iteration of ULED with Quantum Dot technology which Hisense claims delivers three times the brightness of OLED TVs. It says these sets have a colour gamut of 91 per cent of Rec.2020 and 99.98 per cent of the DCI-P3 colour space, with 1000-nit peak brightness. The flagship H9 and H10 models are curved-screen designs with Ultra Black full-array local dimming, UHD upscaling and Ultra Smooth Motion processing. US prices are $1000 for the Hisense 55H9B and $2800 for the top-of-the-range 65H10C (shipping in the second half of 2016). Hisense has also developed a proprietary smart TV platform with a customisable app bar at its R&D centre in Atlanta, Georgia. Further down the range the Full HD H3, H4 and H5 models start from just $100. The H4 models have Roku TV built in as standard with 3000 streaming channels, and the H5 range gets its own web browser and apps. Later this year a large-screen 8K TV will join the range. As soon as we know which of the new models will be coming to the UK we will let you know.